Worrisome: Reported cases of Zika in the U.S. and its territories will soon hit 20,000. The number of Zika cases IN THE U.S. and its territories reported to CDC’s Arbonet (ARthropod-BOrne virus) national registry has risen to almost 19,000. With some researchers suggesting infection in one quarter of the population of Puerto Rico before the end of 2016, 20,000 cases might be a gross underestimation. Reassuring: While the Zika epidemic rages in Puerto Rico, the continental U.S has reported a total of 2,964 cases of mostly travel-related Zika virus illness (out of a population of 320 million). South Florida is the only area in the continental U.S. where local mosquitoes are confirmed by authorities to have spread the disease (about 50 cases). Worrisome: The actual number of Zika cases is probably close to 5 times the number of reported cases. Zika virus causes relatively mild symptoms like rashes, fevers, joint pains, and reddened eyes, and even then in only 20% of cases. 80% have no symptoms whatsoever, which means that the actual number of cases is probably 5 times greater. This doesn’t count people who wouldn’t go to the doctor for a mild fever or a rash, so it might be even more. Reassuring: Even if case totals are, in fact, much higher than reported, the virus leaves the bloodstream after a week or so in most people. It can, however, last for months in seminal fluid or, perhaps, the eyes. Once you have recovered from the acute infection, you receive immunity from the antibodies produced by your immune system. Future pregnancies won’t be affected. Worrisome: Zika is a bona fide pandemic. A pandemic is a widespread occurrence of a disease not normally seen in a place that spreads across different regions. 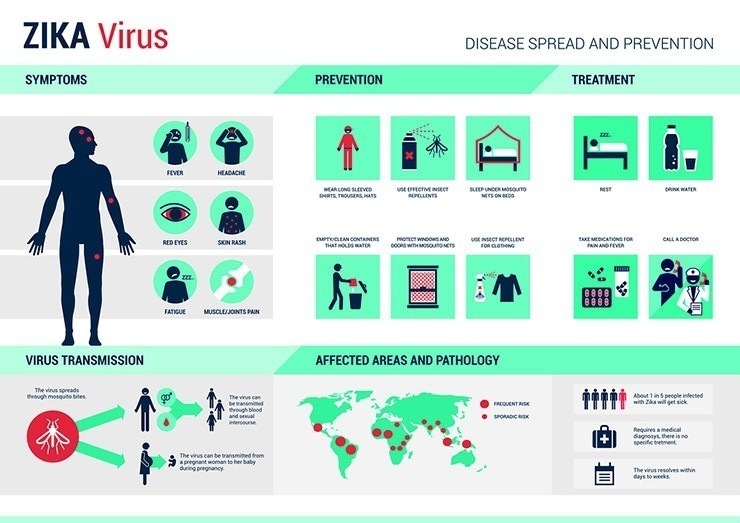 Zika has now been identified in close to 70 countries and has been referred to as a pandemic by the National Institute of Health since at least January 2016. Reassuring: Despite concerns raised by many health officials, athletes and tourists returning from the Olympic Games don’t seem to have sparked significant new outbreaks in their home countries. Worrisome: Newborns with Zika infections can have multiple abnormalities, not just microcephaly. Microcephaly is a condition where a small brain leads to poor head growth. Beside this, however, other evidence of brain damage, deformed joints, and vision or hearing impairment may occur. Reassuring: The percentage of abnormal newborns in Zika-infected mothers isn’t as high as you think. Statistics for the rate of birth abnormalities in newborns have ranged from 1% to 13% in Brazil and 1% in the previous outbreak in Polynesia in 2013-4, according to a CDC report released last May. There are no numbers that say a Zika-infected mother’s chances are very high of having a baby with microcephaly or other defects. Worrisome: We can’t say for sure that Zika-infected babies born looking normal will be unaffected by the virus. Zika is shown in lab studies to kill brain and other nerve cells. What if the number of cells damaged is not enough to make the baby appear abnormal at birth but enough to cause delays in milestones like walking or talking? What if these infants end up having learning disabilities once they’re old enough to go to school? We won’t know for years. Reassuring: Although our research into the effects of Zika virus is in its infancy, no hard evidence exists that a baby from an infected mother will have later developmental deficits. Worrisome: Zika virus may be passed through from human to human through seminal fluid, vaginal secretions, blood, and now, tears. Researchers are finding more and more ways that Zika might be transmissible from human to human. A study from Washington University in St. Louis reports that tears of mice carried parts of the Zika virus. Reassuring: The vast majority of Zika infections are still transmitted by mosquitoes. Sensible actions like the use of mosquito repellents, the wearing of long sleeves/pants, and drainage of nearby standing water are still the best way to prevent an infection. Worrisome: There is more than one strain of Zika, and there may have been mutations. Zika, like many viruses, exists in different subtypes (at least two) that could mutate from time to time. This fact might explain why a virus originally identified in 1947 only started causing community-wide outbreaks in 2007, and no reported cases of abnormal babies before 2013. A mutation that increased the severity of effect on humans (at least, newborn ones) may have occurred. Reassuring: It’s possible that Zika just had never been exposed to such large populations without natural immunity. Researchers haven’t yet reported if the strain spreading rapidly in Singapore is the same one as that in Brazil. Worrisome: There may already be more than one locally-transmitted outbreak in the U.S. Dr. Peter Hotez, dean of the National School of Tropical Medicine at Baylor’s College of Medicine, suspects that there may be more areas of local Zika transmission than just the one in Miami. The Guardian reports that he said, “…I think there’s not just Zika transmission going on in Miami, it’s going on all up and down the Gulf Coast and in Arizona, it’s just that nobody’s looking.” The CDC, although it stops short of predicting an epidemic of Zika, believes clusters of cases may still appear in warm-weather states. Reassuring: Future local outbreaks are likely to be minor in the U.S. A number of states, like Louisiana and other Gulf and East coast states, are recovering from floods dues to storms and Hurricane Hermine. Cases of Zika virus, however, don’t seem to be arising out of standing water there that would be excellent breeding grounds for mosquitoes. Cities, like Houston, with low-income areas that harbor abandoned buildings and trash, also provide possible sites for the next generation of mosquitoes; Zika virus doesn’t seem to have taken hold there either. Worrisome: Aerial Spraying with chemical pesticides like Naled may affect honeybees and even humans. Use of pesticides that are neurotoxic might have ill effects on important pollinators like bees, or even human beings. It might be safer to use methods that kill mosquito larvae instead. Reassuring: Aerial spraying is an effective way to eliminate large populations of adult mosquitoes quickly and rarely affects humans. Naled is a shorter acting pesticide than some others, and when used correctly (before sunrise or after sunset), is unlikely to cause major damage to pollinators, which mostly forage during daylight hours. The recent bee die-off after spraying in Dorchester County, S.C., was due to spraying which occurred at 8 a.m.
Worrisome: A new local Zika outbreak is spreading throughout Singapore in Asia. The location is important because Singapore is an important financial hub for the region. Travel-related cases already have been reported in Malaysia and the Philippines from returning travelers. Given the widespread commercial travel to Singapore, where 300 cases have been reported in 10 days, the entirety of Asia may be affected in the near future. Reassuring: Here in the U.S., the coming fall and winter seasons will decrease mosquito populations significantly throughout most of the country. USA Today reported in July that Brazil was recording fewer cases of Zika as the Southern Hemisphere entered its “winter”. So, it’s your choice: You can decide either to go look for your worry beads or, instead, cover your eyes with your hat and order another pinacolada. Just don’t forget the mosquito repellent.